This month we launch our new series of property spotlights. Each week we will look at average house prices, the total number of sales and the size of the market around the country. Nine regions will be analysed, including the North East, South West, West Midlands, and London. But what are these figures based on? The latest data from the Land Registry House Price Index helps to show the makeup of the region’s housing markets. 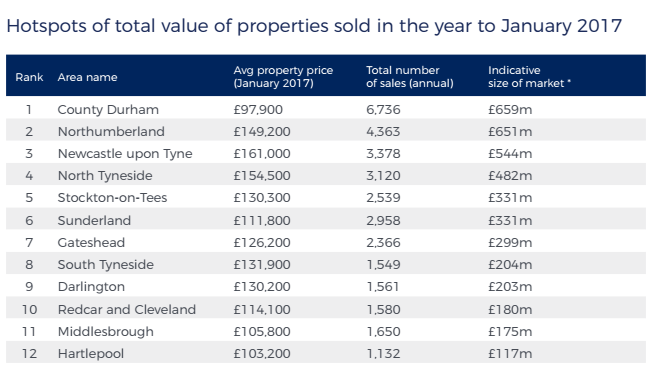 While there is no single measure which provides a complete picture of the market, below are 12 areas with statistics on the total value of all property transactions in the past year. This has been calculated by multiplying the average value of homes by the number of sales. This week, we look at the North East of England. * Average price in the year to January 2017 multiplied by the total number of transactions in the same period. The district with the largest market is County Durham which saw £659m worth of transactions in the year to January 2017. This was followed by Northumberland with £651m worth of sales over the same period. The district with the highest overall average house price was Newcastle upon Tyne where prices sit at £161,000, which is 30% above the regional average. The market with the highest number of transactions was County Durham with 6,736 sales occurring during the period. “The North East property market is a collection of micro-markets, each with their own particular drivers and nuances. Some markets have higher levels of turnover than others and indeed some perform better than others when it comes to capital inflation,” said Iain McKenzie, CEO of the Guild of Property Professionals. Whether you live in the North East or elsewhere in the UK, find your nearest Guild Member agent and start your property search today.